Welcome to Kjemi Grand Prix! There are some important changes from previous years – and the most important change is that this is an INTERNAL event. The goal is that researchers, employees and students get to know what´s going on in the other sections. 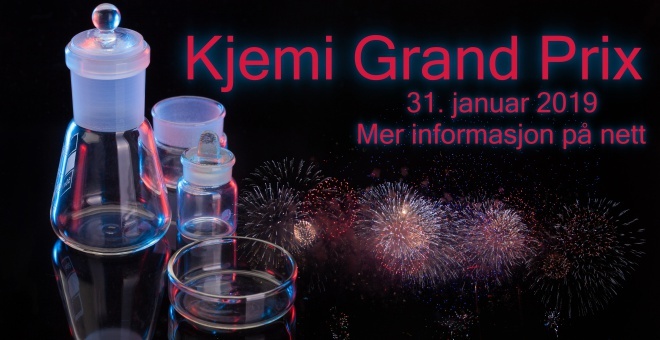 Kjemi Grand Prix is arranged as an outreach competition. The winner is elected by votes from the audience and by an external jury consisting of five members that are not educated chemists. Remember that all of the audience can vote – so other employees, researchers and master/bachelor-students will be able to vote for the best contribution. The candidates are juged by their ability to reach out popular scientifically by giving a four minute-presentation. The candidate can choose to hold the presentation in Norwegian or English. The candidates will be instructed in giving short presentations – and the audience will get a chance to learn more about the research at the different sections. This is a win-win situation! The winner gets 10 000 NOK as a travel grant for scientific conferences or to open source publication. The presenatitions will be recorded and put in social media/on the web. The head of the section is responsible for the nomination of the candidates, and each of our seven research sections can nominate one, maximum two, candidates. The candidates have to be PhD-students, or just having started a research career (that means no more than two years after finnishing their PhD). If you would like to participate, let your section leader know. Maybe you get to represent your section! Last chance for nominating the candidates is the 14th of December. The nominated candidates will get a course in four-minute presentations the 8th of January, with a follow up the 18th of January. The 30th of January there will be a final rehersal with all the candidates in the Auditorium 1. The name and the contact information to the nominated candidates can be sent to Elina Melteig. 16:00 The winner is announced. Remember to sign up (below) so we order the right amount of food! The event is open for all employees and students at the Department of Chemistry!